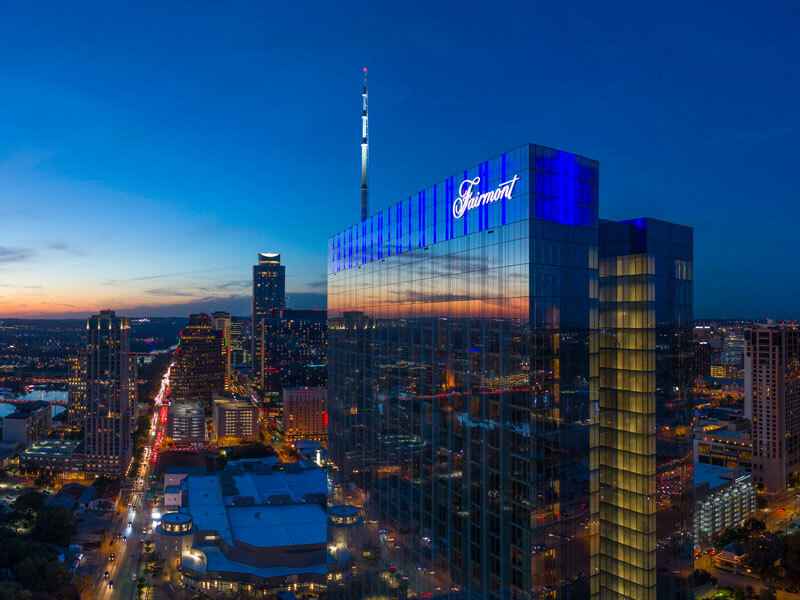 Opened on March 5, 2018, Fairmont Austin is a 37-storey luxury hotel featuring 1,048 richly appointed guestrooms and 60 suites, including the elevated luxury of Fairmont Gold, located on floors 32 to 35. From every room of the hotel, guests can enjoy stunning views of Lady Bird Lake, the Texas State Capitol and Austin’s dramatic cityscape. Boasting exceptional service and amenities, guests can make use of the hotel’s five event venues, seventh floor heated swimming pool, salon, spa and state-of-the-art fitness centre. Fairmont Gold, the only experience of its kind in the city of Austin, is a ‘hotel within a hotel’ luxury service offering for business and leisure travellers. Even before arrival, a dedicated Fairmont Gold team member connects with the guest to ensure their every need is met upon arrival. The Fairmont Gold experience begins at the hotel’s private check-in desk located in the Gold Lounge on the 35th floor. The luxurious 5,000sq ft space features floor-to-ceiling windows showcasing wraparound views of Austin. With five onsite culinary offerings, modern amenities and a dedicated team of staff to attend to guests’ every need, Fairmont Gold has introduced VIP hospitality to downtown Austin. Located on the sixth floor of the hotel, Fairmont Austin Spa is a restful place to retreat from the lively streets of Austin. Fairmont Austin Spa provides a serene space to unwind after an evening of dancing in the live music capital of the world. The spa features nine treatment rooms including two VIP couples’ suites and lavishly appointed solariums. Each solarium showcases a saline soaking pool, eucalyptus steam grotto and European dry heat sauna. Surrounded by Texas Hill Country, the spa inspires wellbeing through naturally sourced, organic ingredients. Whether guests are working towards health and fitness goals or recovering from a night enjoying Austin’s rich nightlife, Fairmont Austin Spa will create a personalised spa ritual for them. Fairmont Austin boasts five restaurants and bars, located throughout the hotel. The ground floor is home to the hotel’s three eateries: Garrison, Revue and Good Things. Garrison is dedicated to open-flame cooking. This modern American grill house serves the highest quality meats, seafood and local produce, elevating these superior ingredients with unique preparation. At Revue, guests can enjoy a globally inspired dining hall. The restaurant’s unique approach to cuisine is defined by its diversity and includes the timeless cuisine of Italy, the epicurean and cultural complexities of Asia, and the delicacies of the sea, topped off with delicious treats from the artisanal pastry shop. For a quick food fix, guests can pop into Good Things to pick up a coffee and a snack or something to eat on the go. Focusing more on drinks and located in the main lobby is Fulton. The bar pays homage to Austin’s music scene, with live music every night making it the beating heart of Fairmont Austin. Meanwhile, the seventh floor features the Rules & Regs bar. Rules & Regs is the place to forget schedules and bend the usual rules and regulations. Whether guests are in Austin to conduct business or explore the city, the Fairmont Austin caters to all tastes and needs.